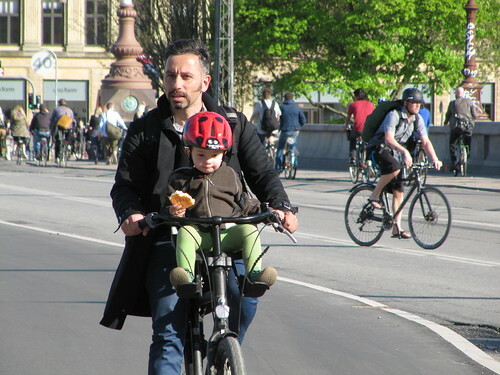 I realised a long-held ambition over the Easter holidays by returning to Copenhagen, this time with camera in hand and a keen eye on the cycle culture over there and the mechanisms in place to support it. 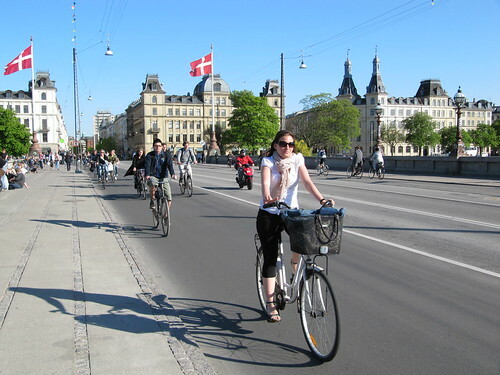 When I first visited, 5 years ago, I just took it at face value that the Danes were a cycling nation and that's why there were 1000s of cyclists on the streets. Little did I think that a true cycling culture is made with streets which invite cycling and nurture and treat those who choose to ride. When you arrive at Central Station you know instantly that you're in a city where cyclists are welcome. 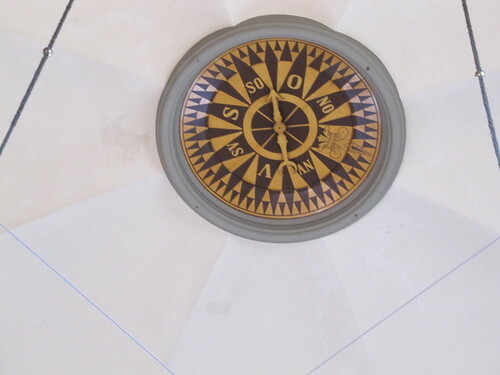 Up in the station ceiling is a large repeater of the weather vane on the roof so that those just arriving know which way the wind is blowing. 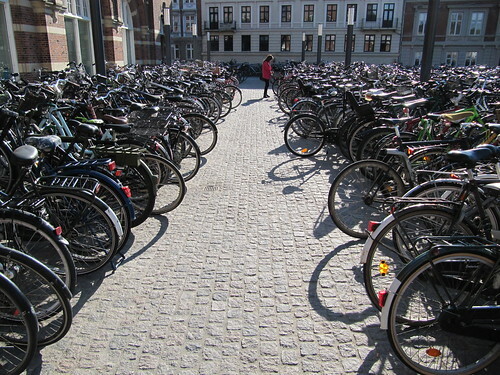 Denmark may not have any mountains to speak of, but nestled as it is on the wrong side of the North Sea it has the meanest head winds, though judging by the racks and racks of bicycle parking right outside the station, the weather is no great disincentive to ride, given the right conditions on the roads. 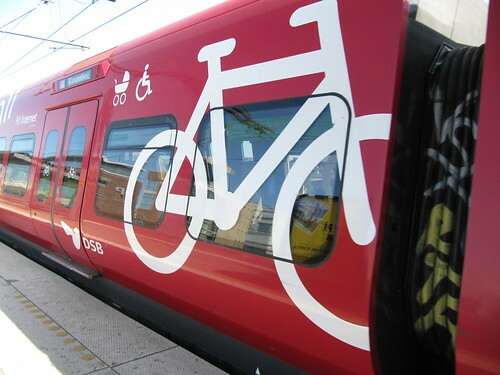 The trains, of course, have generous space set aside for bicycles and even in the city centre stations there are lifts or stair gutters to help you get your bike to and from the platform. And the integration with public transport doesn't stop there. Out in the sticks the suburban bus stops have bicycle parking to encourage commuters to 'park and ride', and should anyone get a puncture (it happens, even in CPH!) 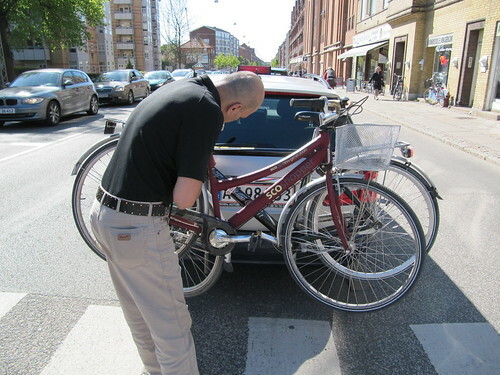 you need only flag a city taxi and the driver will clip on the double bike rack which is carried as standard and make sure you get home in one piece. 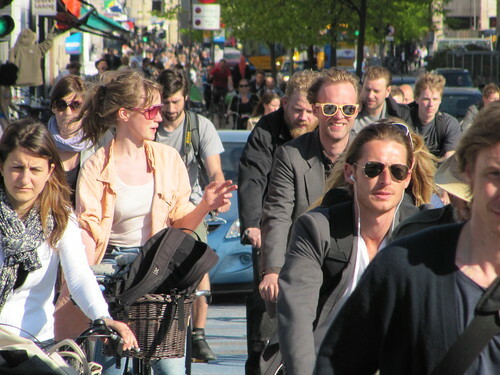 It's clear that when it comes to making bikes fit with city life, the Danes are doing it right. When works threaten the route of a bike lane - and half of the city if currently being dug up for a new sewer and Metro system - they don't just erect "Cyclists Dismount" signs, but put in temporary bike lanes around the obstruction. Temporary road signs, or cables and wires aren't put across the bike lanes, but hoisted well clear above them - why would the city want to slow down its cyclists just to spoil a different mode of transport? There's free air on hand in the Town Hall Square for those who might be feeling a little flat, and a blinking bicycle counter tracks how many cyclists have rolled by that year (in red) and even that day (in blue - 10,301 when I took the below photograph on a weekday afternoon) to remind cyclists they're never alone and don't have to feel like a minority, and to gently remind drivers to watch out, as there's lots of bikes about. 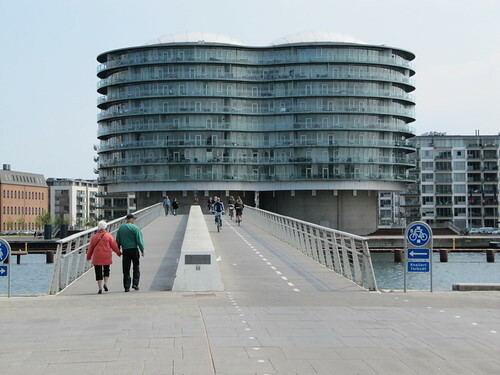 When the city built their own equivalent of the Millennium Bridge for pedestrians across the sparkling harbour, they didn't forget cyclists but tacked a bike lane on the side. Meanwhile, cars have to drive a mile the other way before they can cross; what clearer way of saying "people on foot and people on bikes come first"? 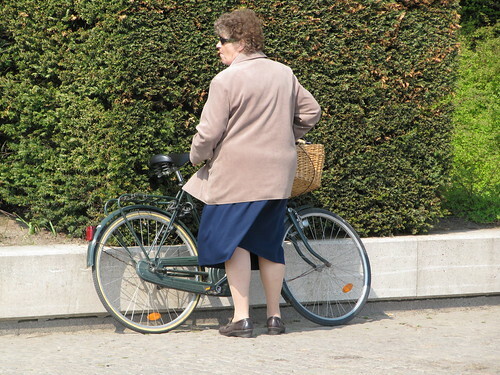 ...indeed, a whole cross-section of society gets around on two wheels. 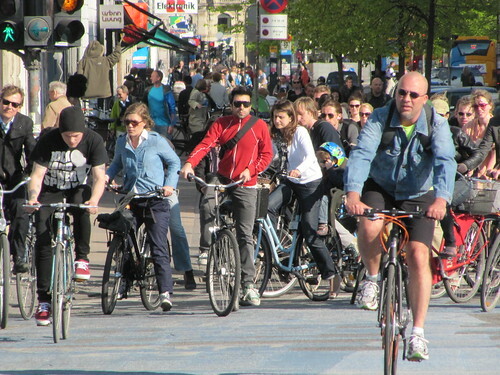 So what is it that has made all of these people choose a bicycle over any other form of transport? 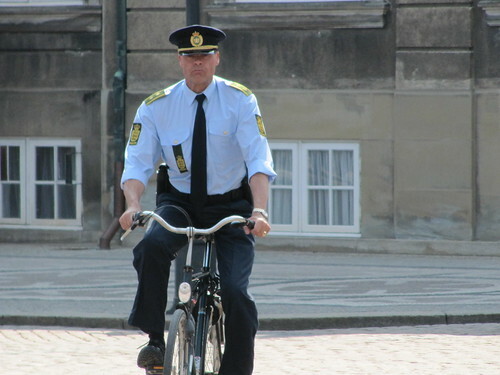 Is it because the Danes are a great cycling nation? Hardly, Copenhagen was as car clogged as any other Western city in the middle of the last century. Is it because the city is flat and easy to navigate? Not really; the centre is a dense core of mediaeval streets and the headwinds are a killer. The city is no more flat than London and sprawls into suburbia just as much. 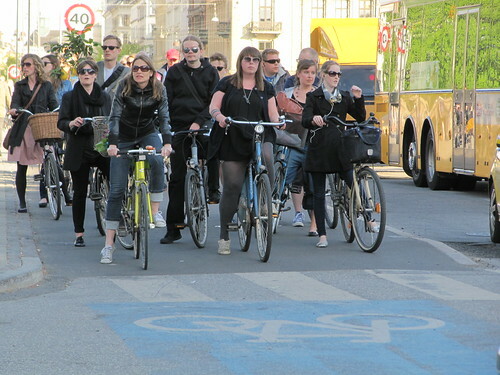 Were Copenhageners won over with cycle training, or cycle parking standards, or free maps of the city? Perhaps, all these things help of course, but that's just nibbling away at the edges rather than dealing with the biggest issue head on. 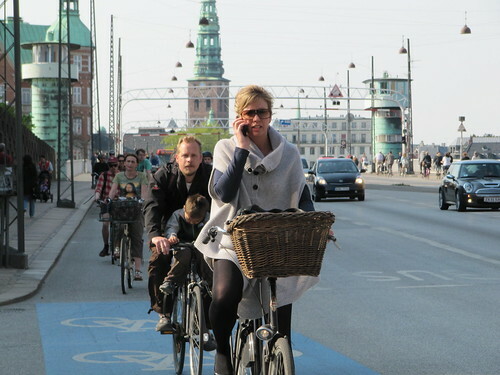 It was clear to me, throughout the city, that the important difference between Copenhagen and London is that on the big, busy, main roads (think the South Circular, or High Holborn, or Park Lane, or Vauxhall Bridge), cyclists were kept separate from intimidating traffic and given their own slightly raised and generous bike tracks. At junctions bicycle traffic lights gave them a few seconds head start, and due to their sheer volume turning cars always waited for bicycles to pass before crossing their lanes. Pedestrians knew not to stray in to the bike tracks, and likewise the cyclists kept out of the way of traffic. Of course, segregation isn't everywhere; just as here in London it wasn't necessary to keep slow moving traffic on quiet small streets apart, but where it really mattered and counted towards providing a subjective and statistically safe bicycle network for everyone from kids to pensioners on bikes, the infrastructure was there for them all. Did I feel ghettoised at all by using this network? Did it feel like I was relegated to a second-class road user? Not at all - indeed, cyclists seem to be spoilt by this inviting cycling system. What's more, I didn't break into one of those "dealing with traffic" adrenaline sweats once during my entire stay. As my newly-converted-to-cycling partner exclaimed; "I feel safer, happier and more comfortable riding a bike here, on the wrong side of the road, in a foreign country, on a different road network, than I do in my home town. How wrong is that?" Dane living in London here - you just made me feel homesick! 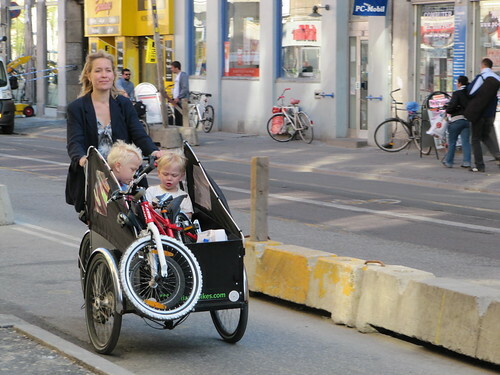 Nice writeup and although the cycling is more challenging and "dealing with traffic"-adrenaline-inducing I still love cycling in London and exploring the city on two wheels. I think you actually caught an MP on a bike in one of your pictures. Kamal Qureshi from the Socialist People's Party looks very much like the guy squinting at the sun in IMG_8359. Hello Michael, sorry for causing the homesickness - your home capital was certainly an inspiring and indeed beautiful place to visit! I also love cycling in London (see the rest of the blog), but I do so despite the prevalent road conditions, not because of them. I love that it's the best way to get around town, but I just wish we had a system that convinced enough other people to think the same. 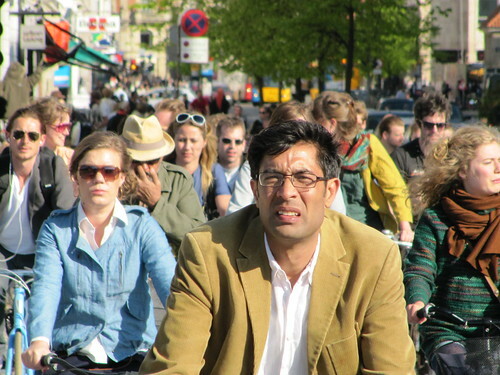 Cool that I caught a Danish MP on camera, it's good to know they're out there on the bike tracks with the people! Hmmm stuff like this frustrates me. 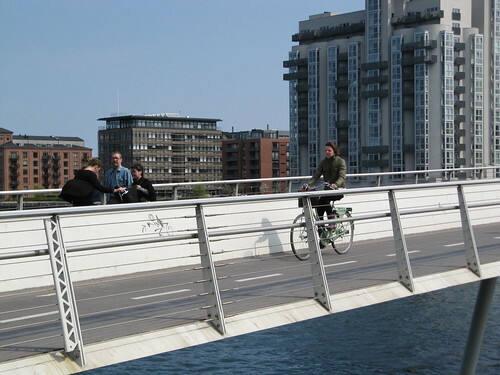 Copenhagen has amazing cycling infrastructure because people in Denmark asked for it. 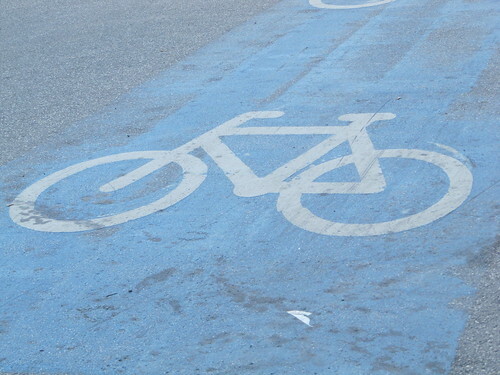 Yes, lots of bloggers are happy to blog about how crap cycling is in London (not a criticism btw), but I'm yet to see a single one actually protest. Where are the marches? Where's the direct action? Until we start getting our hands dirty, we have no one to blame but ourselves. Sorry. P.s. i'm planning one, and really wrote this to drum up some support. I think it's more the case not that people aren't asking for it, but that certain people in higher advocacy circles have routinely asked *not* to have it. I remember a petition a few years ago aimed at women which was signed by 1000s and 1000s asking for safe cycling infrastructure. It became so popular that it was promptly dropped by the organisation who had fielded it because it would wed them to asking for the sort of stuff I'm talking about above. 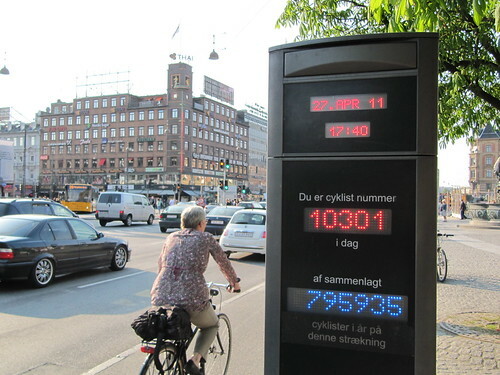 If this post about Copenhagen in turn helps to get people fired up then so be it! And hardly a helmet in site! I linked to some of your photos, hope thats ok? Hi David, you're more than welcome to use the photos in that manner. I've read that Cycle Chat column, and, to be frank had a number of head banging moments. That there are some cycle campaigners who believe it will be easier and more desirable to impose a 20mph limit on dual carriageways than to build proper good quality cycling infrastructure on the same roads is entirely beyond me. I have great faith in the British public; I believe most are capable and happy to potter around their local streets and on quieter shared roads. But in order to make any number of useful journeys they know that they have to get from A to B using busy main roads. 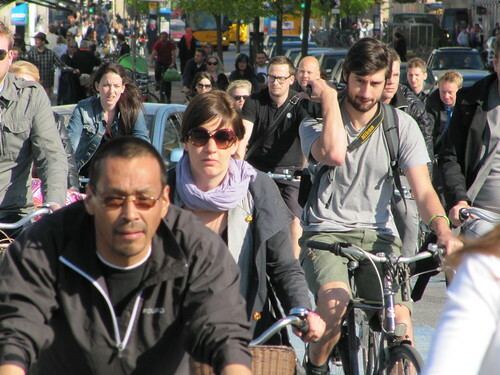 To expect everyone to do this (the sorts of people you see on the photo above) is laughable and most people will not do this and for good reason; it is a deeply hostile and unpleasant environment in which to cycle. 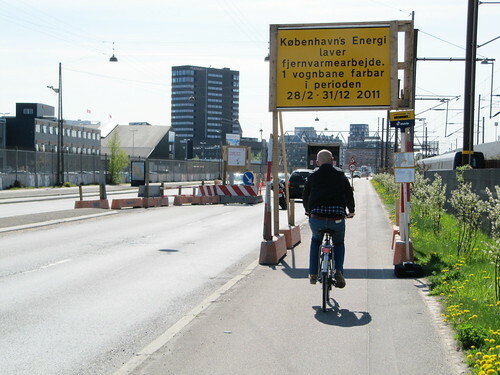 Until we get over this obstacle there will be no mass cycling in this country. 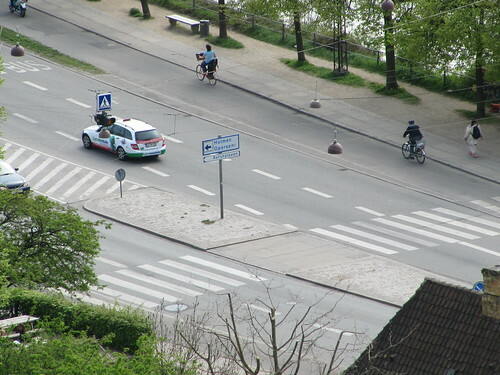 Segregation, where appropriate, is so painfully necessary that it would seem some cyclists can't see for looking! Good luck on the 20th Sue - I would LOVE to be there, and will most certainly be in spirit if nothing else. I'm glad that any teething problems Clover's cycleways had at the begining are being ironed out and look forward to riding them helmet free when I get back to Sydney! !